Since this past Olympics, Tessa Virtue has officially become one of the most decorated figure skaters in Olympic history, with three gold medals and two silver medals. Virtue and her partner Scott Moir are known for their incredible artistry and the connection that they share on and off the ice. Tessa’s instagram is a snapshot of her life. Her page displays motivational quotes, inspiring workout videos, and her regal sense of fashion. She’s one to watch! Bethany Hamilton is an American Pro Surfer who notoriously survived a shark attack in 2003. During the attack, she lost her left arm. After training and rehabilitation, she finally got back in the water and now has quite the impressive professional surfing career. Her instagram is full of bright colors and picturesque landscapes of beaches and waves. Her two children make appearances in her pictures as well, donning big smiles. This gymnast is not only a two-time Olympic competitor, but a strong advocate for women’s rights. She has been notable in the recent media for being one of over 250 women and girls to sue Larry Nassar for sexual assault. Aly has taken a stand in the media, shining a light on the importance of uniting against sexual assault and encouraging others to speak out. Her Instagram page is full of inspirational quotes, photos with her fellow gymnasts, and body positive, feminist messages. Serena Williams is an American professional tennis player who is known for her incredible talent. With 23 singles titles in Women’s Grand Slam Tournaments, she has the record for the second-most titles won in history. Her Instagram page includes action photos of her playing tennis, workout videos, and just a glimpse into her normal life as a mother. Her daughter is super cute and her account is definitely worth the follow. While this athlete is not quite as well-known, she is just as inspirational. Becca Longo was the first woman to receive a football scholarship from a NCAA Division II School. 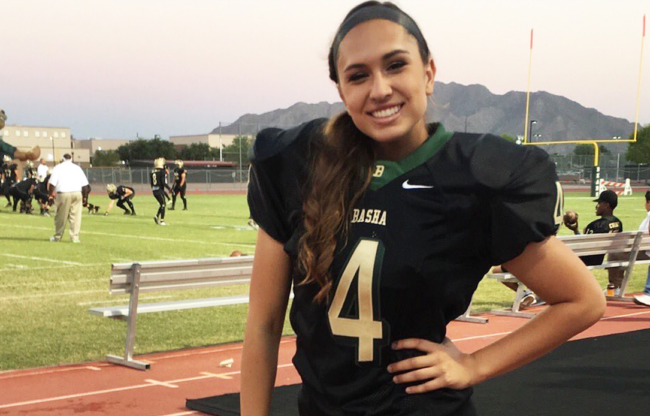 She is currently a kicker at Adams State University in Arizona. Her Instagram page could motivate even the most unmotivated, with pictures of Becca weight-training and shots of her with a football. Sprinkled amongst these pictures are photos of her and her friends and family.